A healthy shoreline property is a place where we can rest, relax and play! But if it’s not taken care of, our actions can also result in erosion, loss of wildlife habitat and reduced water quality. Keeping shorelines natural is the easiest way to protect water quality and the value of shoreline properties. Check out these five tips that will help you keep your shoreline healthy! 1. Give yourself a buffer zone. Leave as much native vegetation along your shoreline as possible. This helps filter sediment and pollutants before they reach the lake. The area also provides valuable habitat to a myriad of species! 2. Rethink your retaining walls. Hardened shorelines deflect wave energy instead of absorbing it, causing erosion problems further along the shoreline. If your shoreline has a retaining wall, plant vegetation along the top of the wall to help filter runoff and reduce the risk of erosion. 3. Take another look at your lawn. With a shorter root system, lawns aren’t able to stabilize the soil and filter sediments and pesticides as well as native vegetation which has a longer root system. Did you know that over 55 per cent of precipitation runs off lawns which can go directly into a lake? Keep lawn areas set back from your shoreline and maintain it with minimal or no water or harmful pesticides. 4. Maintain your septic bed. 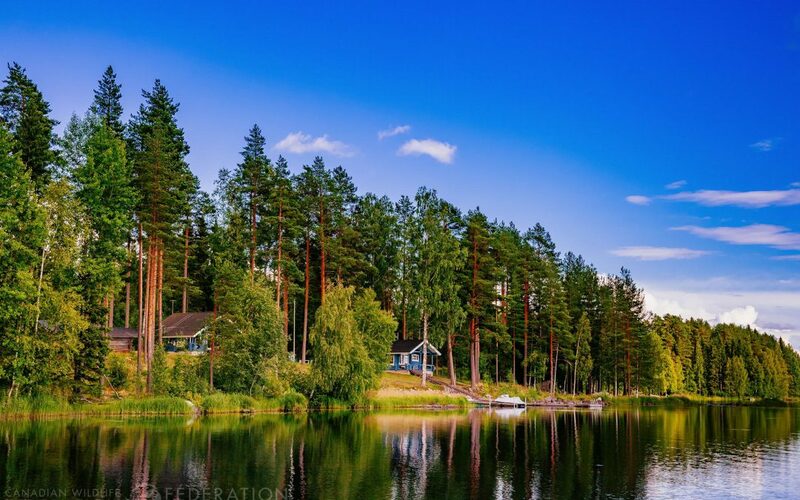 Faulty septic systems and improperly treated sewage can harm both your health and the health of your lake. Make sure to get regular pump outs and inspections and be careful of what you put into the system. 5. Fix your paths and stairs. If you have a cottage on a slope, reduce your impact on sensitive soils and fragile banks that lead down to the water by creating a path that meanders rather than one that goes in a straight line. 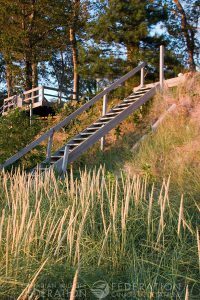 If you prefer stairs, make sure they are raised off of the ground with open backs so that rainwater and sunlight can reach the ground encouraging vegetation to grow.